The mushrooms, toadstools or fungi that attract the most attention tend to be the more colourful, exotic, rare, recognisable or tastiest types. The Clouded Funnel can lay claim to none of these virtues. They are as common as muck and, while at one point considered edible, are now seen as best avoided for the table. 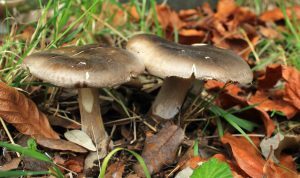 Nevertheless, despite the prevalence of the species in both coniferous and broad-leafed woodland environments, this belle laide of the mushroom world does have its charms if you are prepared to look more closely. Fairly generic in appearance, they are also highly variable in size and shape. The mushroom fruit bodies start off ovoid or domed, with the perimeter of the cap slightly in-rolled before expanding outwards as it grows, and the margins becoming increasingly wavy as they raise upwards. 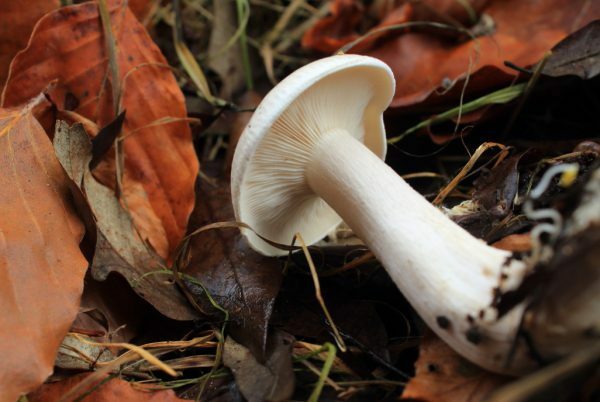 They never quite achieve the same distinctive funnel shape of other Clitocybes like the Ivory Funnel (Clitocybe rivulosa), Trooping Funnel (Clitocybe geotropa) or Aniseed Funnel (Clitocybe odora). Nevertheless, Clouded Funnel can look pretty similar to several of these species, some of which are considered toxic, an aspect which, along with reports that it itself has been known to cause gastric upsets in some cases, should deter even the more desperate forager. The dirty pallor and generally tatty appearance in its advanced stages are unlikely to tempt the taste buds anyway. It is from this grey drabness of the top of the cap that it gets the ‘clouded’ (or ‘nebularis’) part of its name, but this can vary in degree too, from a sort of tarnished sallow white to dull blue-grey, brown-grey to near charcoal. The cap tends towards darker in the centre, and is slightly felty when young, developing a white powdery coating on top with age, and is sticky when wet. The flesh, stem and the gills that run semi-decurrently down it are white or a slightly yellowish pub-ceiling off-white. 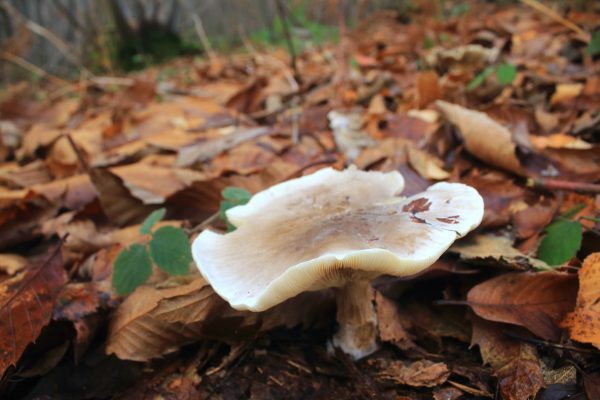 The stem is stout and solid, getting up to 10cm long and 2cm wide, and with the cap reaching around 20-25cm in diameter, there’s a familiar chunkiness to these mushrooms. Unlike such fly-by-night types as the inkcaps, which come and go in a matter of hours, these fruit bodies tend to stick around for many days. So essentially while individual specimens can look wildly different, there is a certain essence, an instant recognisability, to the species. 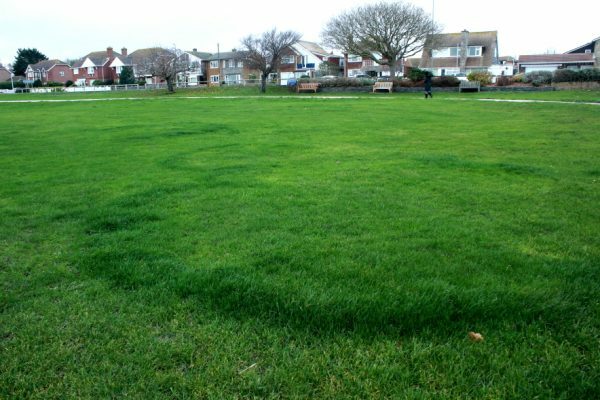 They also grown in groups, and can form pretty sizable fairy rings, which expand over the years as the mycelium root system grows. Actually, this needs qualifying, because it is misleading to think of the mycelium as a root system as such, whose sole function is to sustain the mushroom body. Instead, one should think in terms that the mycelium – a network of near-invisible threadlike cells called hyphae that externally digests nutrients – effectively is the fungi, and that the mushrooms, which fruit only at certain parts of the year, are only just the reproductive organs. This is the same for all fungi, regardless of their substrate. 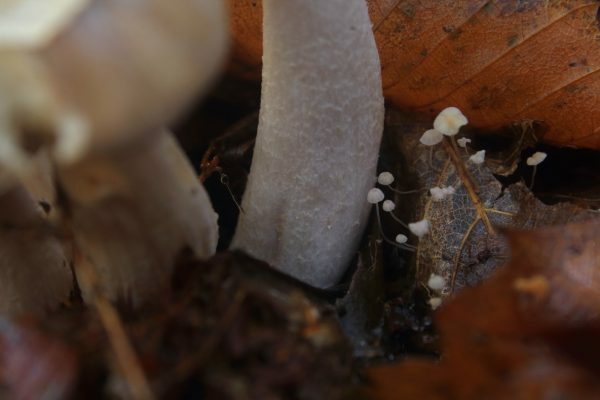 In fact, there are also numerous examples of micro-fungi that exist in the soil that never even produce visible fruiting bodies. Many foragers use the famed example of an individual Honey Fungus (Armillaria mellea) specimen in North America, which is thought to be the largest living organism on this planet with its mycelium mat covering a massive 2,384 acres of land in Oregon’s Blue Mountains, as evidence that most fungi are far larger than meets the eye, and therefore that picking the mushroom fruits of any type is relatively harmless. However, very little research has been done into how extensive this mycelial network is for the majority of species, yet alone individual specimens within them (nor indeed how they react to having their reproductive organs wrenched off). Of the various fungi that grown in fairy rings, the best-known grassland type is the Fairy Ring Champignon (Marasmius oreades). The size of their circle gives some indication as to how old and established an individual organism might be. We know that the mycelium grows outwards from the center over time, and the mushrooms grow from the perimeters of this ring, while the interior of this ring represents where the mycelium, the fungi itself, has died off. Therefore the larger the ring, the older the particular fungi. Clouded Funnels usually grow in forest soils, however, where unlike grassland habitats the ring itself is not really apparent. If you only see a clump of just a few close-together mushrooms, this might be just one small outer section of a larger ring, or it might be that the ring itself is tiny and in its earliest stages of growth. I think unless you are monitoring an environment over a matter of years, with the mycelium itself consisting of threadlike cells that are so thin they are virtually invisible to the naked eye (but in any case, you can’t see it due to the simple fact it is growing underground), there’s really no way of knowing how big or indeed how old the organism is. Clouded Funnels might provide an interesting and more general analogy with the way fungi dwell within their favoured substrates. 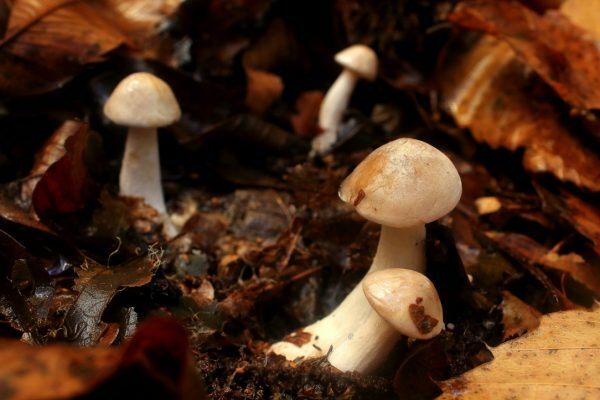 The species is saprophytic, meaning it exudes an acid from the mycelium to decay dead organic matter such as fallen leaves or twigs or maybe even bacteria or other fungi, which it breaks down into a form that it uses for food. If the outer edge of the mycelium cannot find food, the cells at the extreme tip of the mycelium die back, while the mycelium puts all its energy to grow the tips in directions where there is food. Over many years, then, one could imagine that individual fungi are effectively moving, invisibly and underground, around the forest. Because the mycelium is not a root system, the fungi is not rooted in one spot. It is a network of cells that morphs in form and position within a three-dimensional space, migrating to where the nutrition is, just as the shape and position of a cloud is dependent on meteorological conditions like moisture and temperature gradients. I mention all this because one thing I have learned in my searches for different types of fungi to find and photograph is that there are good reasons why one should never overlook the more common and arguably not particularly photogenic types such as Clouded Funnel or even the Earthballs, which I posted about last Summer. Crucially, when you get right up close with a lens at ground level to them, you often notice other things that you might not see otherwise. 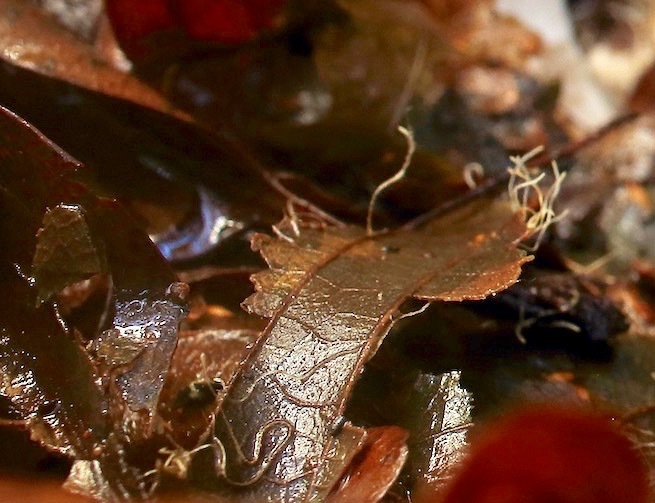 Zooming right into this picture, for example, you can see some of the individual hyphae that comprise the mycelium emerging from the surrounding leaf litter that it is breaking down for food. There may also be other mushrooms growing in their vicinity, suggesting either that a particular patch of earth might be damper or richer in the right types of nutrient, or maybe that certain fungi tend to like each other’s’ company, with the secondary species maybe finishing off the job of breaking down the organic matter that the first one started - in a way I posted about a year ago, with wood-rotting species such as Dead Man’s Fingers or Candlesnuff following on from where Honey Fungus or Sulphur Tufts have started the process of decomposition – which in turn lays the ground for non-fungal organisms, like bacteria, worms, insects and other invertebrates, to continue the job of forest soil creation. 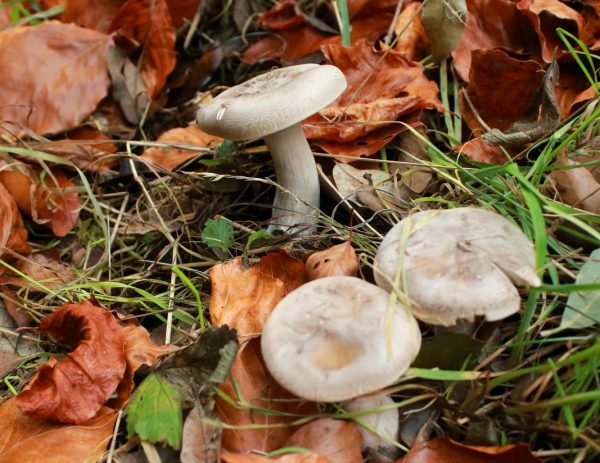 Last Autumn, I discovered a veritable mycological microcosmos within several feet of a patch of Clouded Funnels. Growing nearby, was a handful of similarly saprophytic Buttercaps (Collybia butyracea, aka Greasy Tough-Shank). Across a couple of dead leaves around these, were the oozing plasmodium and tiny pinhead fruiting bodies of a Physarum slime mould (slime moulds are not fungi, and neither are they responsible for the process of decay, but they do feed off the by-products of fungal decomposition). And growing from the base of another Clouded Funnel, I also found a Mycena specimen, possibly Beechleaf Bonnet (Mycena capillaris). Beechleaf Bonnet at foot of clouded funnel. 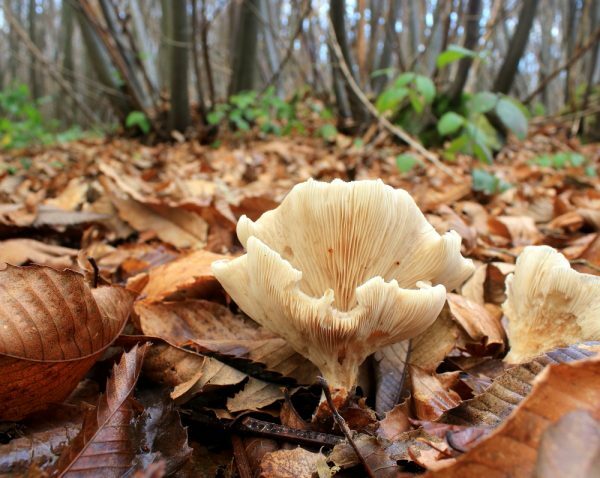 I will be taking a closer look at these in future Monthly Mushroom posts, but I hope the message is clear – never overlook more commonplace fungi like Clouded Funnels, which are all part of a larger natural ecosystem, and most surely an indicator that a forest environment is a thriving one.